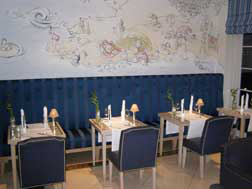 The Baltic Sushi Bar at the Grand Hotel Heiligendamm in Germany opened in October 2007 and is where Chef Ferlyn Dias offers a delectable Asian menu. Asian music plays lows in the background creating the ambience for the intimate restaurant which features a bar at the front of the room where diners may sit on stools and watch the chef in action, and a long banquette at the back of the room with tables. Bistro tables with tall stools are placed at the sides of the room, and in the center of the room there is a square table flanked by four black leather armchairs with hobnail detailing and blue, cream, and brown striped fabric cushions. Walls of French doors and windows dressed with blue striped Roman shades grace the opposite walls of the rectangular dining room. Edward F. Nesta and I had dinner at the restaurant in March 2008 during our stay at the hotel, and what I most enjoyed about the Baltic Sushi Bar is their wide selection of Asian specialties including sushi, sashimi, and curries, which satisfied Edward's desire for sashimi and my longing for curry. Sitting at the center table dressed with a white runner and pristine white napkins rolled into tall tapers with red lacquered chopsticks tucked into the napkin folds, with tea lights on the table, and two curly bamboo stalks in a clear vase, we began with an aperitif of champagne to accompany Dim Sum that arrived in a small round bamboo steamer box set on a square white plate. 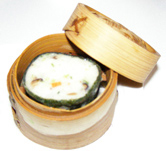 Opening the box we discovered a lovely surprise of a delicate Nori roll of steamed rice and prawns, which teased our palates and left us with great anticipation of what was yet to come. Edward loves soup and for his first course he selected the Hot and Sour Thai Crustacean Soup with Prawns and Straw Mushrooms (Scharf-saure Krustentiersuppe mit Garnelen und asiatischen Strohpilzen), which was a delectable course presented in a large bowl of rich and spicy broth laden with sliced mushrooms and prawns. I had the Wakame Seaweed Salad with Sweet and Spicy Sesame Dressing (Hawaiianischer Seetang Salat in süß-scharfem Sesamdressing), which was a lovely starter of a plentiful arrangement of a mountain of seaweed on bed of carrot "spaghetti" sprinkled with sesame seeds and garnished with flat-leaf parsley and a red chili pepper cut to resemble a flower, with radish sprouts adding color and a tasty hint of spice arranged around the salad on a large round glass plate. Edward was in Sashimi heaven when his Classic Sashimi Box with daily fresh fish and seafood, daikon, and all the trimmings (Klassische Sashimi-Auswahl mit allen tagefrischen Fischen und Bellagen) arrived for his second course. The large square wooden box was attractively presented with seven types of fish, sliced yellow peppers and zucchini artistically arranged, cherry tomatoes, thin cucumber disks, julienne daikon and carrots, pickled ginger, garnished with herbs, sprouts, and lime slices, and of course, all of the accompanying sauces and wasabi. Curries are a mélange of flavors that meld in the mouth and provide layer upon layer of sensations, and the Paneer Curry with Spinach and Peas with Spiced Rice and Eggplant Chutney (Vegetarisches Curry aus Kuh-Frischkäse mit Spinat oder Erbsen und Aubergineenchutney) was a large bowl of spicy Paneer curry, (Paneer is a type of Asian cheese), that was an especially nice course paired with the spiced rice with raisins and nuts, and served with thin melt in your mouth chips, and three accompanying sauces. Although the desserts listed on the menu looked very tempting, we decided to decline, as the portions of our other courses were quite ample. We left the restaurant pleasantly relaxed and satisfied.